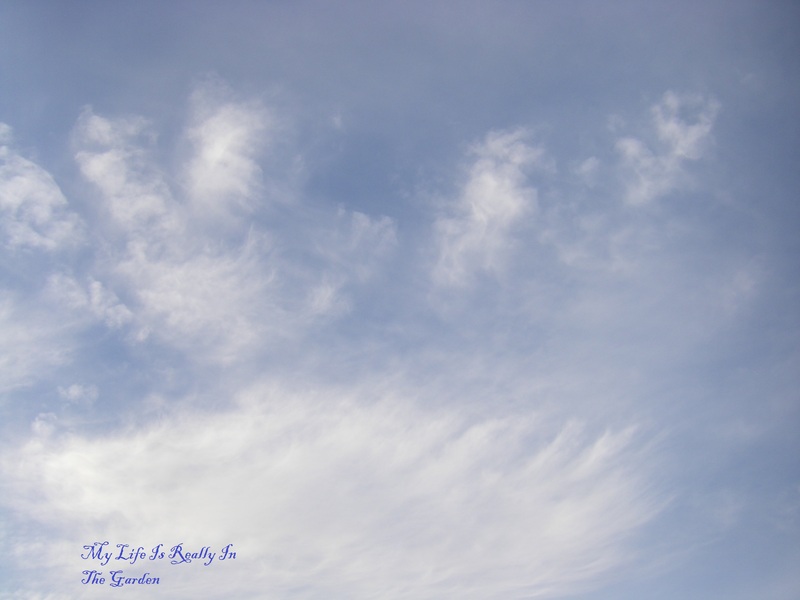 Blue skies! 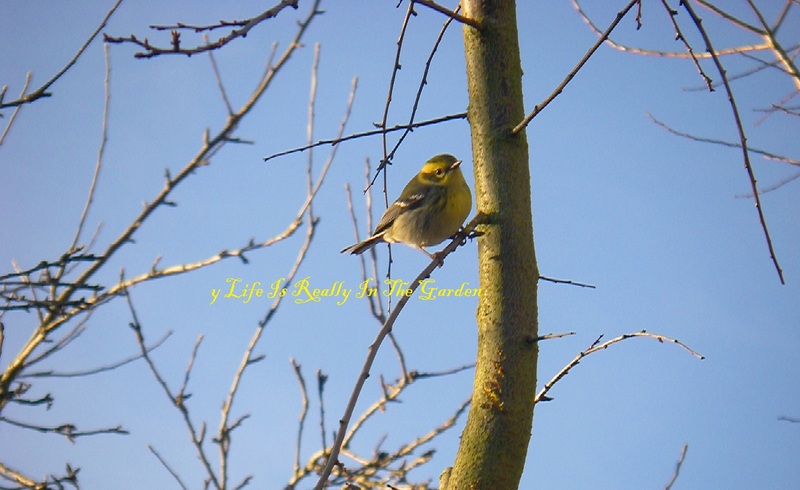 And I am so very lucky .. there is a beautiful female Townsend’s Warbler visiting our yard!!!! Everyday I think .. that perhaps I’ll just sit down at the computer and type away. And every day I don’t. There seems to be a timeline that works best for me .. early morning ..and once that early time has passed .. the day just gets to be busy and so I procrastinate till later. Weather has been fantastic. Lots of sun which results in lots of birds flying around the yard. This series of formations were just awesome ..
As you can see .. a lot of time spent, again, gazing upwards ..
Little Bushtits .. many more this year. The families are growing. Note to self: research these darling little birds and find out their territory and more details. Very clever and cheerful little sprites, they are! They just seem to swirl into the yard. 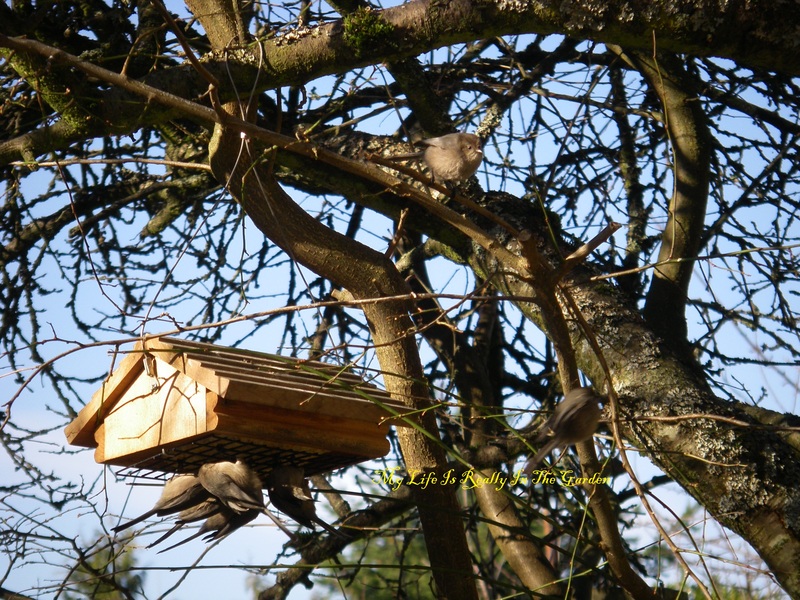 I have 5 suet holders so there is lots for everyone. 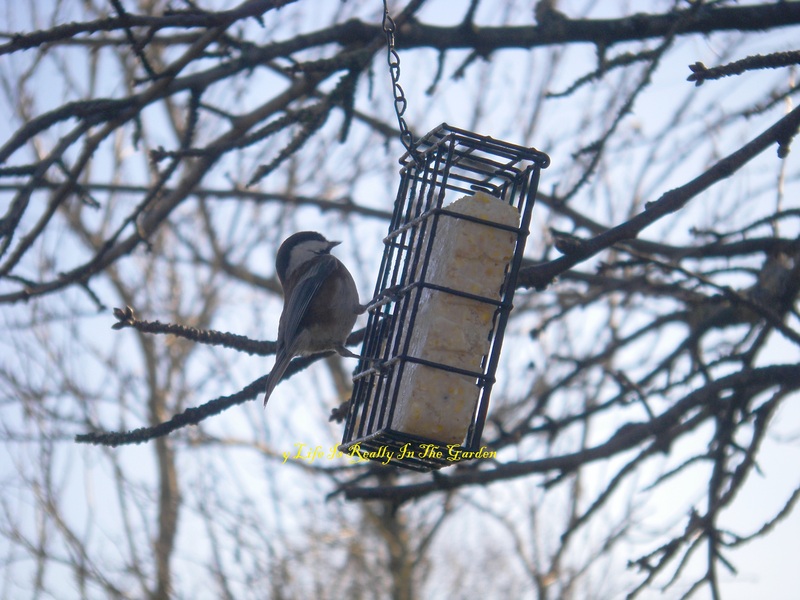 Little Chickadees visit the feeders and the suet blocks …alternating between both, for a more balanced diet. And all of these little birds peck away at insects on the trees, on the house .. everywhere. They certainly earn their keep. Plus they bring so much joy into my world. But .. look here .. this very striking bird started visiting our yard a few days ago. Thus far I’ve only had the most tantalizing little glimpses. Yesterday I stood motionless for at least half an hour, trying to take a picture! A few days ago, I happened to be standing by a suet holder and this little bird flew to a branch just inches away. I didn’t dare breathe .. just stood quietly so I could watch. Yesterday .. I was busy trimming branches and omg .. there she is!!!!! Quickly whipped out the camera and so lucky to snap some photos! I’ve learned that she is a female Townsend Warbler! How exciting is this! And they are only in a specific area …living in forests .. and here she is .. in our little mini-forest!!! Time to go outside and work with some of the seaweed that my pal D and I gathered a few days ago. Another great day and I’ll share that tomorrow. 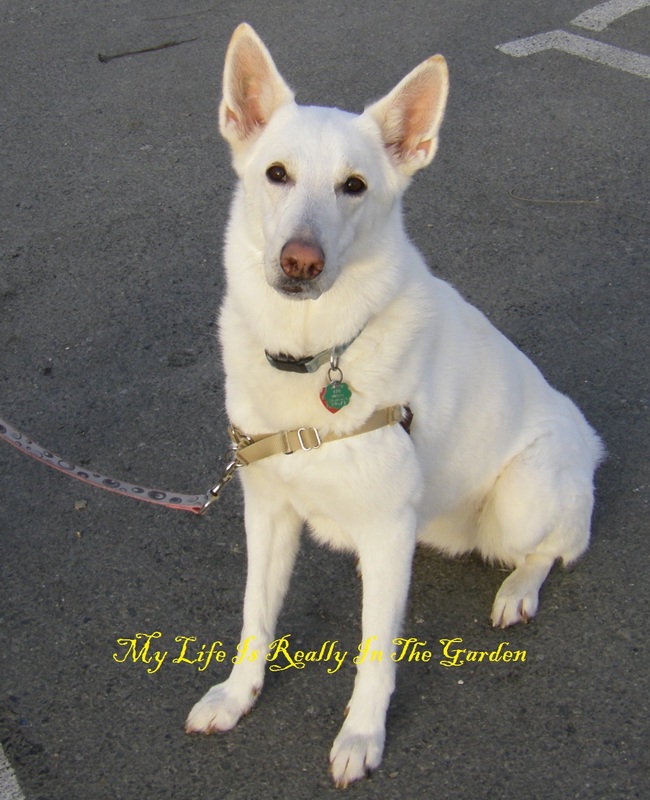 For now, though … .here is lovely Val … we met her at Sooke and she posed for a photo. What a darling kind dog she is!! So, time to make a mug of tea, change into my gardening costume and head outdoors! 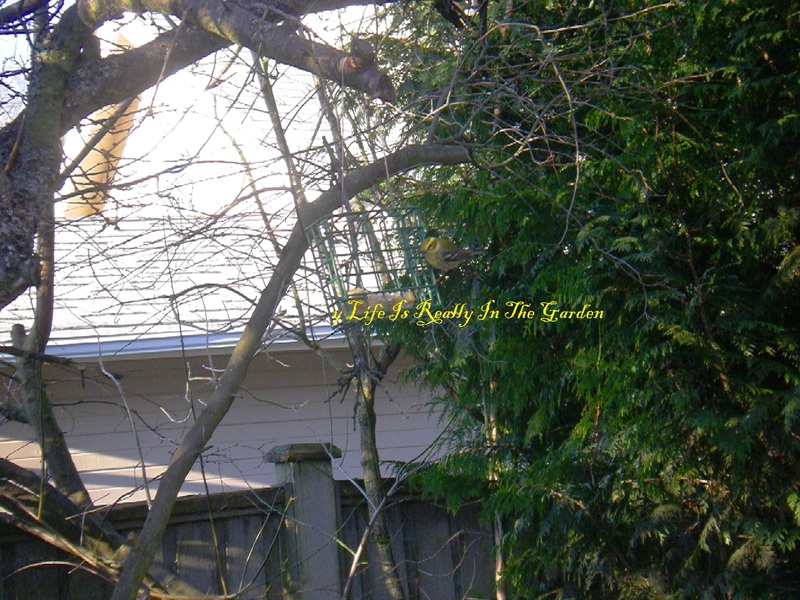 Categories: Gardening | Tags: Bird, birdfeeder, Bushtit, Downy Woodpecker, female Townsend's Warbler, Garden, little birds, nature, outdoors, sky paintings, Suet, townsend warbler | Permalink. Wednesday (like today!) 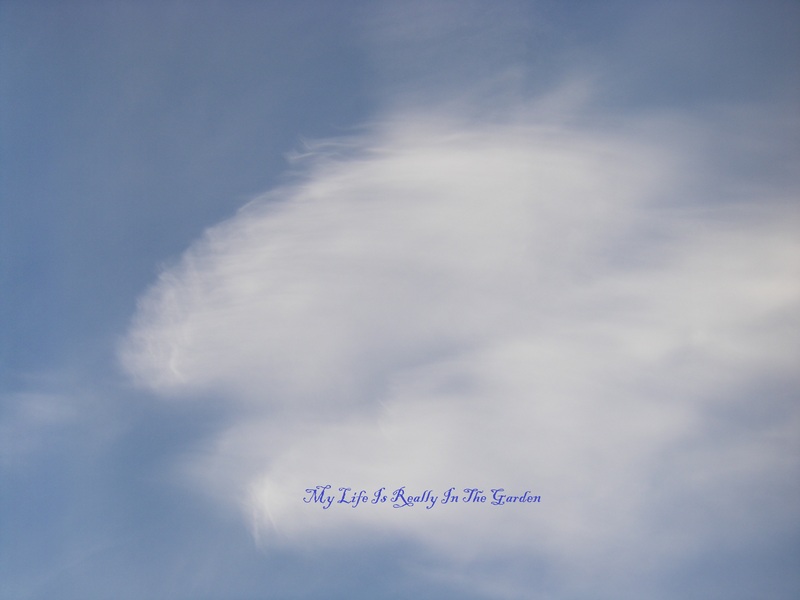 … lots of sun and blue skies overhead, yea!! Spent some time playing with my newest garden treasure .. my yard cart .. it is so very useful, how did I manage without it! It holds so much material and also handy for easily moving tools around the yard. I really feel like a spoiled gardener! And watched the Bushtit hop over to the feeder … to check out this interesting feeder … the perch is just the right size for his little claws to cling to. He seems a bit puzzled now … where is the food ..
See .. it’s built just right for me ..
Perhaps you are right .. this one is perfect for me! I saw 3 Downy woodpeckers in the yard .. wondered, are some of them the babies from last year? They visited all of the suet blocks in the yard. I’ve placed 5 of them throughout … and this one is the special, made in BC item that D noticed on the side of the road, a few weeks ago. It’s once again fulfilling its purpose .. to hold food to feed the birds! And .. I did not see this rainbow till I downloaded the photos …. 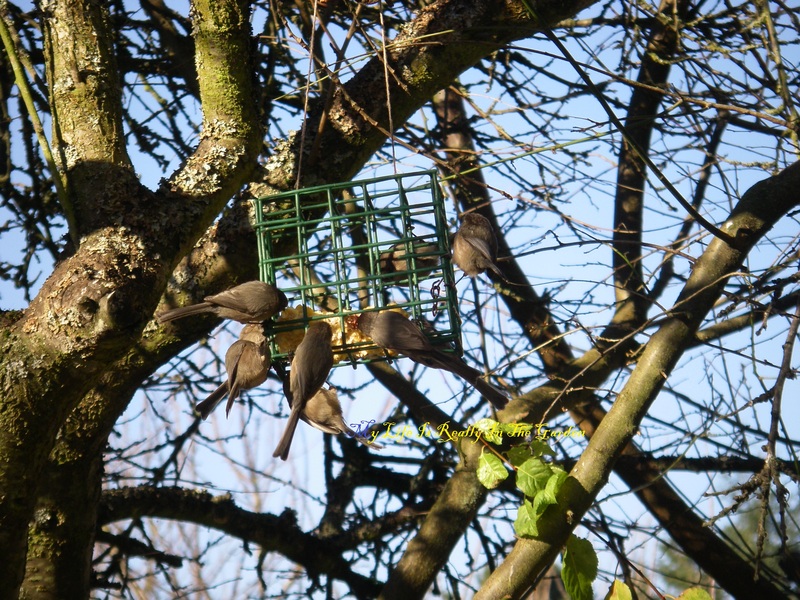 how perfect is this …is this positive energy from the feeder … happy again, feeding the birds ??? 2 years ago … I couldn’t see many robins in the yard at all. Yet this year there are quite a few. And they are all robust. This one is pecking away at a fallen apple. The little Fox sparrow .. patiently waiting, again! 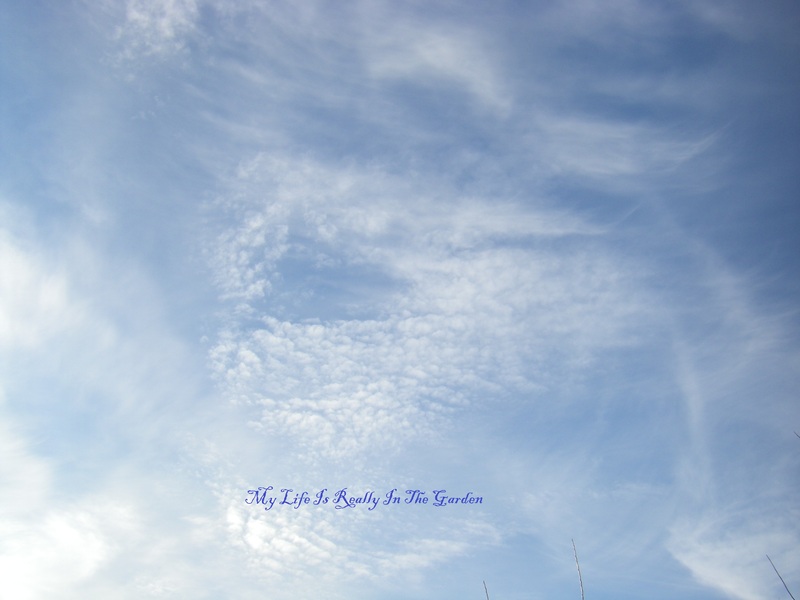 Jet overhead … someone going somewhere exotic? I like to think so. Sweet-pea seed pod ….I’ve left some on the plants .. maybe they will sprout and grow more beautiful flowers. Still can’t bear to pull the sweet-peas up .. I’ll let them go on their own time. Surprise treasures in the yard! I’d just finished planting some garlic cloves (found a good head of garlic from Salt Spring Island and wanted to grow some of that type). When, surprise, I found these bulbs had rooted in a pot. No soil. Well, bulbs are hardy, that is for sure. So I carefully separated them and covered them with some mulch, ready for planting today. There are also some other bulbs with them, I think they might be tulips. Will plant them in a pot and wait for Spring to see if I am right! So .. time to put on my lovely gardening outfit .. my trusty Carhart bibs .. how very elegant! 🙂 and outside to plant these lovely garlic cloves .. there is still time for them to grow. In the spring (not far away) I will commence with the application of EM .. on everything!!! Magic. Twas a great day and I expect more of the same today! Categories: Gardening | Tags: Anna, Bird, birdfeeder, British Columbia, Bushtit, Downy Woodpecker, downy woodpeckers, Gardens, hummingbird feeder, moving tools, nature, plants, Suet, yard cart | Permalink.